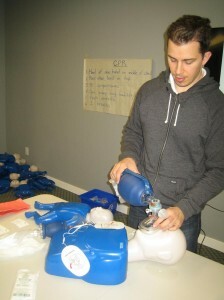 Get first aid certification with the largest, lowest priced and most popular Ontario WSIB approved provider in Mississauga. Learn to manage and recognize emergencies that include heart attacks, stroke, cardiac arrest, hypothermia, broken bones, concussions, heat stroke and more by enrolling in the popular two-day standard first aid and CPR course. Other popular programs include emergency first aid, WHMIS, TDG, food safety, pet first aid, stand-alone CPR level “HCP”, oxygen administration, BLS and transportation of dangerous goods. Certification provided through these courses will boost your resume and employment skills and teach you valuable safety and life-saving techniques. Visit the Mississauga First Aid website for a list of available classes and schedules or use the contact information provided below. To view the upcoming schedule of the above noted classes use the contact information posted higher on this page. To schedule, purchase or book any of these services please use the contact information posted above. All on-line courses are available for registration on the Mississauga First Aid Website. DO NOT use anything in the nose such as a swab or a stick. DO use tweezers to remove the lodged object. STOP trying to remove the object with tweezers if you experience pain. DO NOT try to inhale the object. Breathe through your mouth. DO blow nose GENTLY. Only do this once. Close one nostril then blow the other with the lodged object.